Educational efforts in Sustainable Agriculture take many forms in Waldo County. Individual producers (vegetable and dairy or livestock) consult with UMaine Extension on topics specific to their farm operation. Many issues are possible, including forage crop management, feeding and nutrition, health and metabolic problems, labor and training of employees, and pest management. There are numerous opportunities for group education, including classes at trade shows, field days, and at the research station in Orono. Several producers also participate in on-farm research, including trials with new products, technology or alternative production. Last year, an organic producer conducted a trial with seven different corn varieties for silage, including some open pollinated types. Most livestock farms in Maine need certified nutrient management plans. An extensive training and certification program was developed in Waldo County and training of producers will continue through the next few years. Plans for over 3,000 acres have been developed in conjunction with the Waldo County Soil and Water Conservation District and the Natural Resource Conservation Service. UMaine Extension in Waldo County also participates in numerous educational opportunities with the Maine Organic Farmers and Growers Association who are now located in Unity. 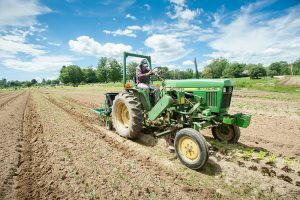 “Small Farm Field Day” and the annual “Farmer to Farmer Conference” are co-sponsored with UMaine Extension and draw hundreds of producers from all over the state for educational talks and demonstrations. Other workshops are also offered from time to time, including poultry, pasture management, and a “Beginning Farmer” course. Tractor Safety for youth and adults is offered through UMaine Extension every spring at Ingraham’s Equipment in Knox. Classes are also offered for pesticide recertification credits.